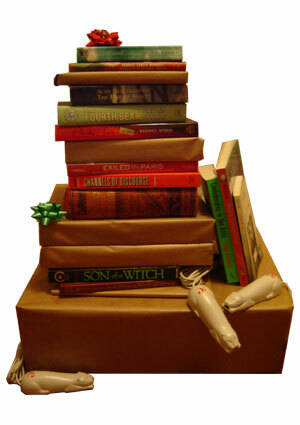 SantaThing 2010: Secret Santa for Booklovers! It’s time to announce the fourth annual SantaThing! What is SantaThing, you ask? * SantaThing is Secret Santa for LibraryThing members. The idea is simple. Pay $25. You play Santa to a LibraryThing member we pick for you**, and choose up $25 worth of books for them, based on their LibraryThing library or using their short description. Someone (secret!) else does the same for you. LibraryThing orders the books and pays the shipping, and you get the joy of giving AND receiving books! You can sign up for yourself, and you can also buy in for anyone else–LibraryThing member or not. If the person doesn’t have a LibraryThing account, make sure to mention what kinds of books they’d like, so their Secret Santa can choose wisely. Even if you don’t want to be a Santa, you can help by suggesting books for others. This year, we’re ordering all books from BookDepository.com. After three years of tinkering with how we order, we decided this is by far the easiest solution. *** BookDepository ships to the most number of countries (see the full list), and they have free shipping on orders of any size****! After years of spending hours and hours manually ordering for each Santa, their bulk upload of orders is going to leave us enough time to decorate the LibraryThing tree (otherwise known as “the stick in the corner of the office” in previous years). The sign-up will close Monday, November 29th at 8pm Eastern time. Once the sign-up closes, you’ll be able to use the same page to pick for your Santa. Picking closes Wednesday, December 8th at 10pm Eastern time. Once the picking ends, the ordering begins, and we’ll get all the books out to you as soon as we can. There’s no guarantee that we’ll have books out by December 25th, but we’re going to try our darnedest. Go sign up to become a Secret Santa now! Questions? Ask them in this Talk topic. *I feel like I should break into a holiday-sounding song to describe it. I found a Christmastime flash-mob in Cincinnati for you instead. **We match members based on the contents of their catalog, thereby matching you with a Secret Santa you share tastes with. *** Two years ago Amazon let us use Amazon Prime. Last year they ended up nixing it, so we had to eat all the shipping charges. As for independents—which we were an option last time—while we’d like to support them, less than 5% of members chose them last year, and the orders were spread out. Book Depository has agreed to give us free shipping, and a special spreadsheet that will cut down on all the manual labor. ****All the time! Go check them out—their prices are often as low as other online booksellers, and the free worldwide shipping with no minimum order is the absolute icing on the cake. So SORRY, but I still don’t understand HOW this works. Is this a book-exchange? I live in Hawaii, USA.